Image editing is one of things that can seem a little daunting. 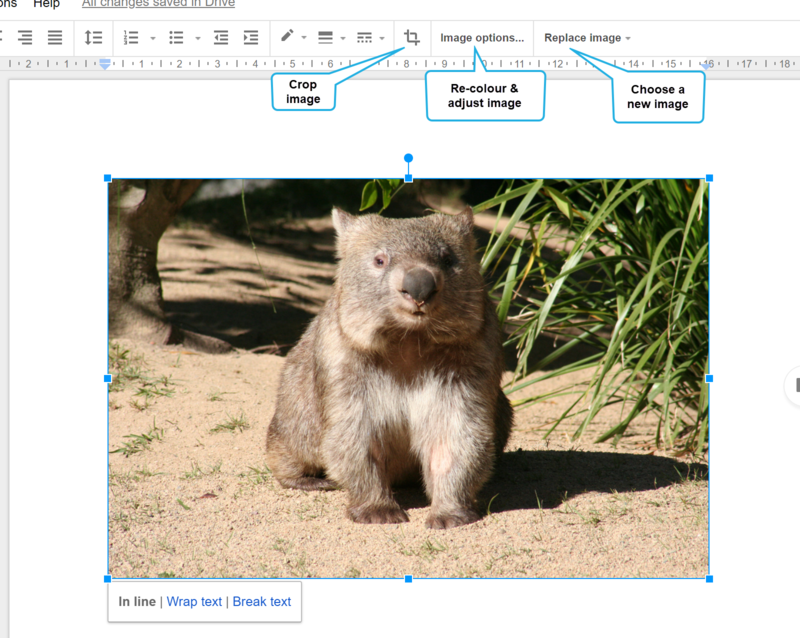 However, Google Docs and Google Slides both include some basic image editing tools that are very easy for anyone to use! In this blog post, we’ll show you how to use each of the tools available to put your own flair on images. The first step is to insert the image into your Google Doc or Slide. If you’re looking for an image to get started with, check out Lara Kirk’s post on five smart ways you can find images to use in your documents and presentations. To access the image editing tools, simply click once on the image you have inserted into your document or presentation. In Google Docs, this will display buttons for Crop, Image options and Replace image, as shown below. In Google Slides, this will display buttons for Crop, Mask, Reset Image, Replace Image and Format options, as shown below. The crop image tool is available in both Docs and Slides. It allows you to ‘trim’ the sides of your image to make it smaller and more focussed on the important parts. 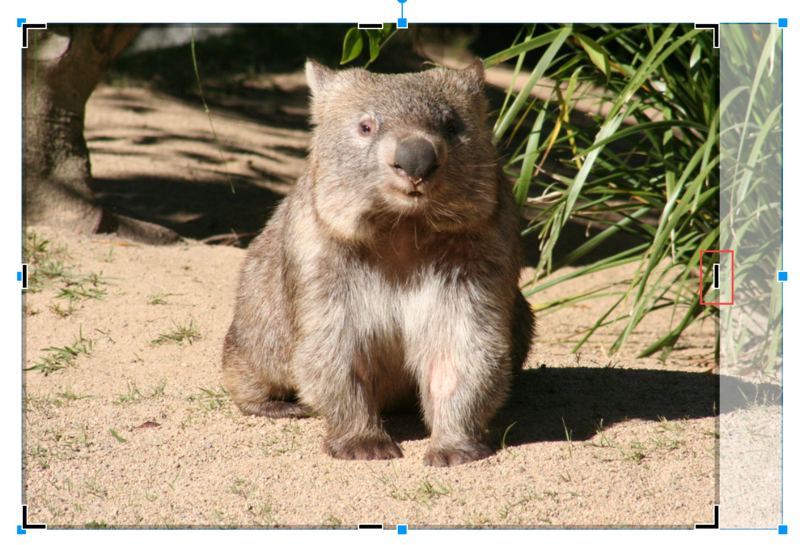 To crop your image, click the Crop button then use the black lines on the corners and sides to trim the image. Press Enter when you are finished. 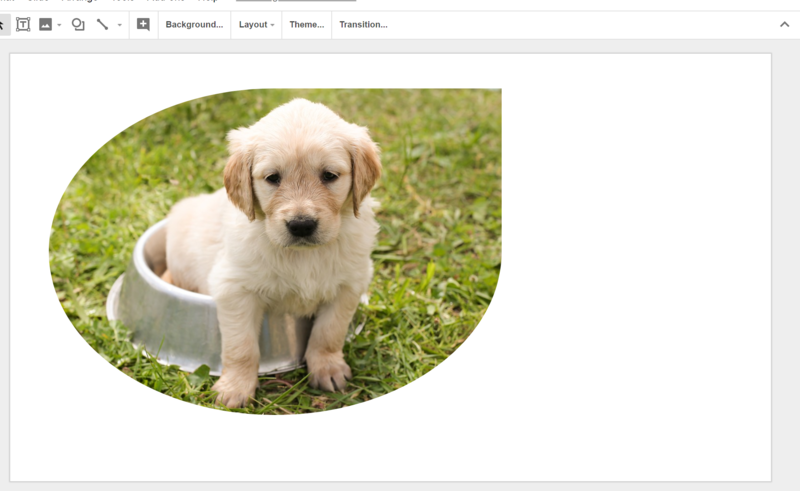 The mask image tool is only available in Google Slides. It allows you to change the shape of your image. To mask your image, click the little arrow next to the crop button. Choose the shape you want for your image. The re-colour tool is available in both Docs and Slides. It allows you to change the colour shade of your image, including making it black and white. To re-colour your image, click the Image options (Docs) or Format options (Slides) button. 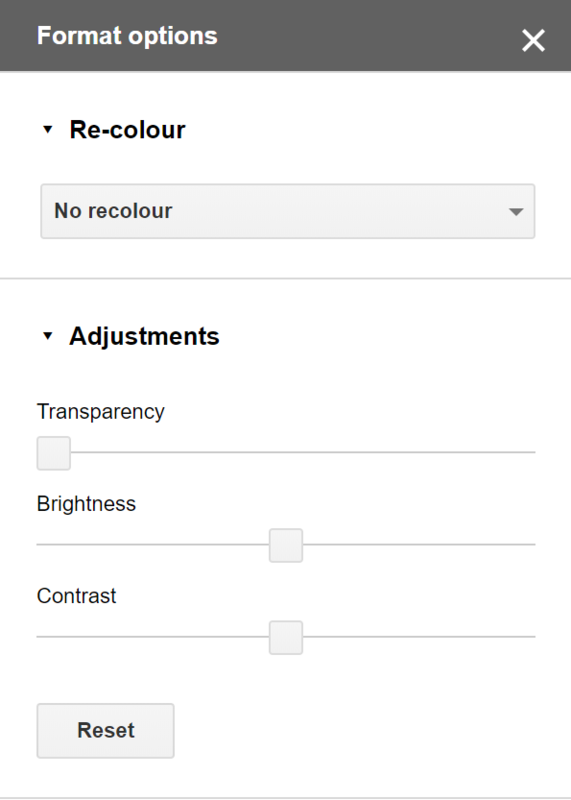 Click the re-colour drop-down box and choose the shade. 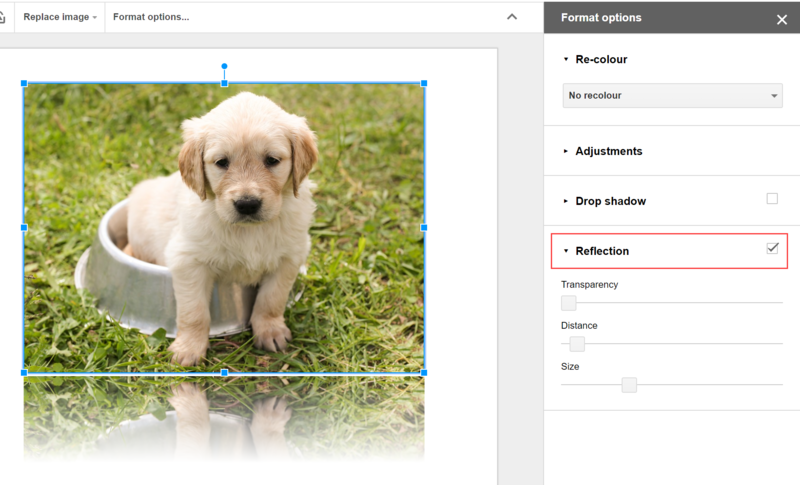 Both Google Docs and Slides have tools to adjust an images transparency, brightness and contrast. This is great for creating backgrounds (in Slides) and correcting low-quality images. 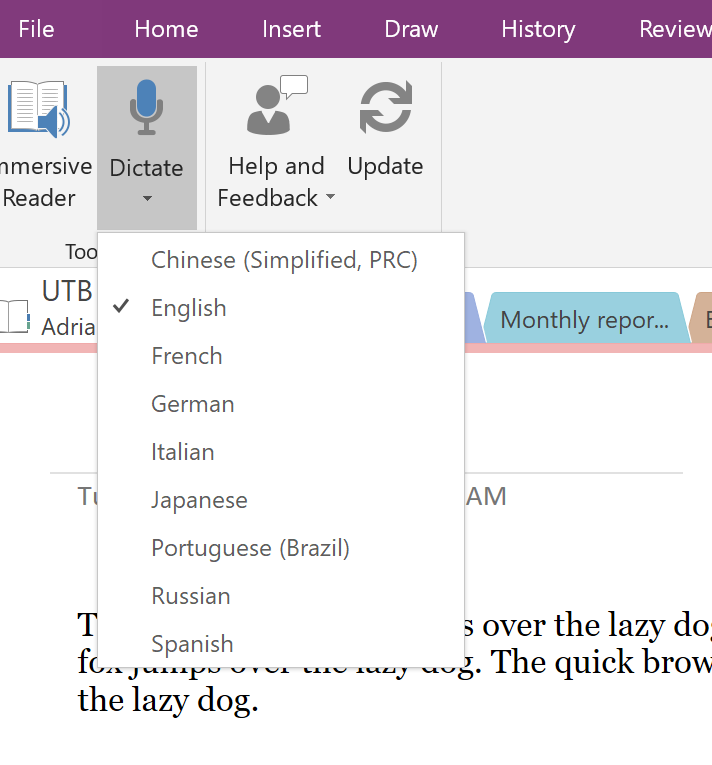 To use these tools, click the Image options (Docs) or Format options (Slides) button. Open the Adjustments section and use the sliders to adjust each element. 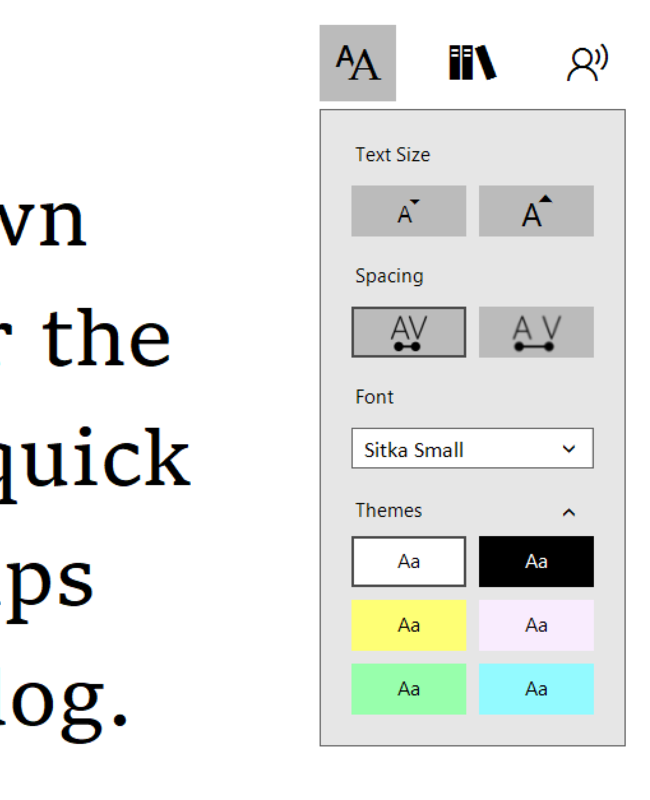 The drop shadow tool is only available in Google Slides. It allows you to add a shadow to your image. 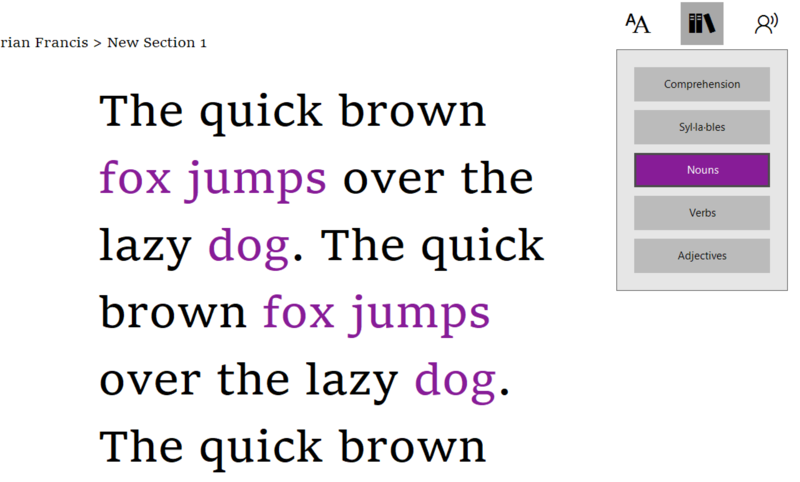 To use the drop shadow tool, click the Format options button and tick the Drop shadow option. Expand the drop shadow section to customise your shadow further. You can choose the colour, transparency, angle, distance and blur radius of the shadow. The reflection tool is only available in Google Slides. It allows you to reflect your image onto the slide. 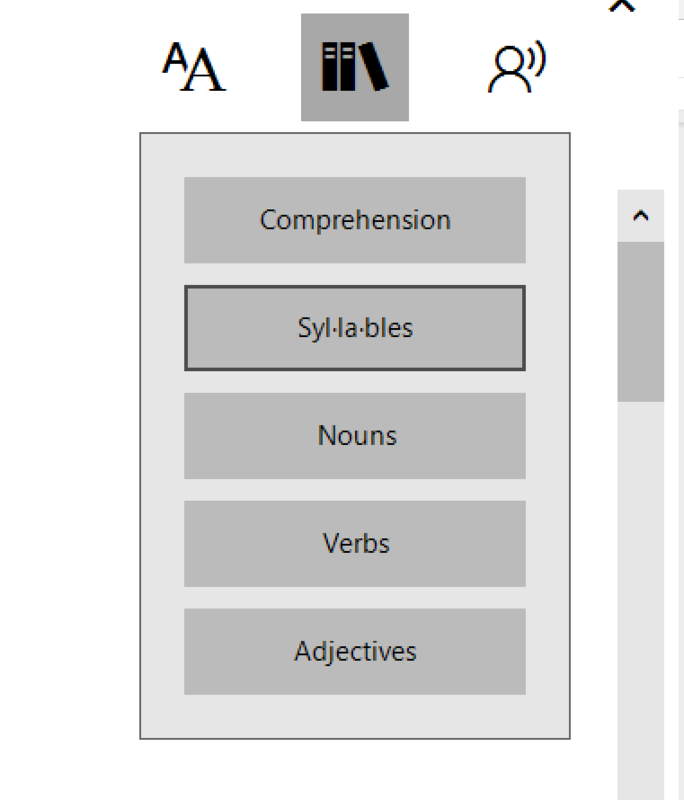 To use the reflection tool, click the Format options button and tick the Reflection option. Expand the reflection section to customise your reflection further. You can choose the transparency, distance and size of the reflection. 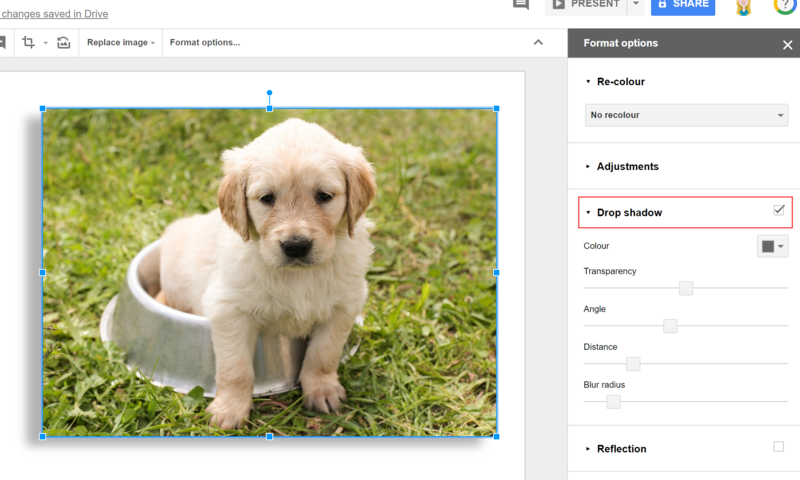 In both Google Docs and Google Slides you can use the reset image tool to remove some of the edits you have made to the image, including cropping and masking. However, changes such as re-colour, drop shadow and reflection need to be removed by de-selecting the options. Note: In Google Docs, the reset image tool is located within Image options. 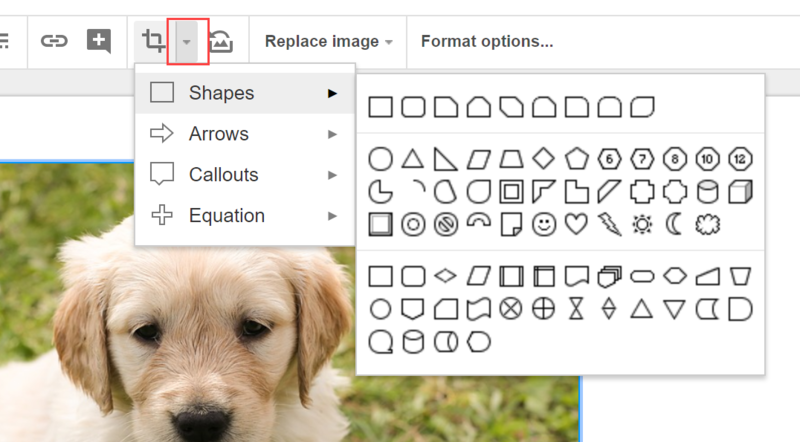 The replace image tool is available in both Google Docs and Google Slides. It lets you choose a new image without losing the size, edits and formatting you have applied to the existing image. For example, if you have applied a mask or a drop shadow to your existing image, the new image will also have these edits. With these simple tools you no longer need to be daunted by the idea of image editing! If you want to learn more about the power of Google Docs and Slides, join our online professional learning community. 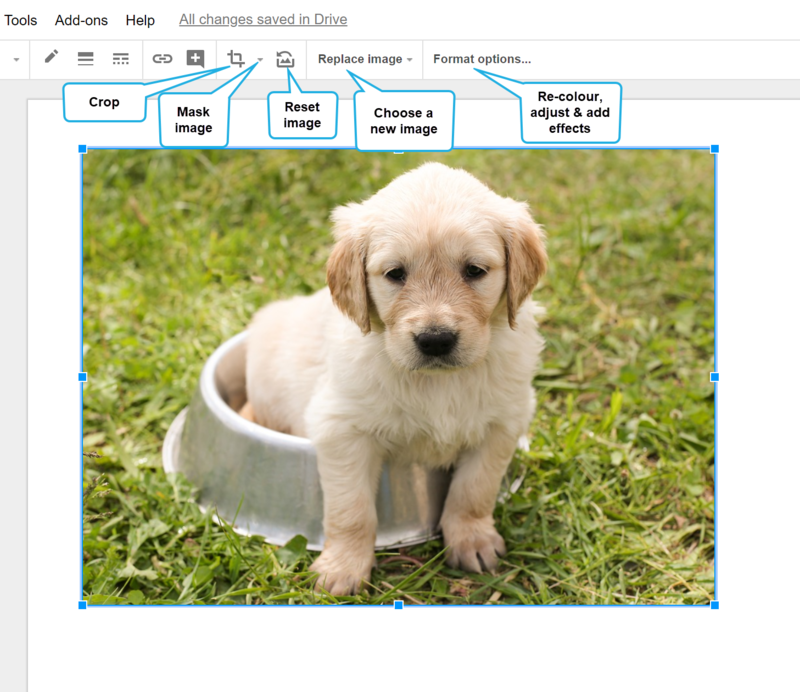 Check out all the image editing tools available in #Google #Docs and #Slides! Click To Tweet. Scratch 3.0 – What’s new? Scratch 3.0 is available to try in beta version and it has some awesome new features. I’ll show you a couple of them in this video. If you’ve never used Scratch before or are an old pro you’ll be delighted by how much computational thinking can be developed in this user friendly system to design games, animations and stories. Head to https://beta.scratch.mit.edu/ to give it a go! For more ideas on teaching digital technologies check out our other blog posts on the UTB website or check to see if we are holding an event near you soon! Here at Using Technology Better, we have team members located in three different countries and across four different time zones. We also work regularly with clients from across the globe. 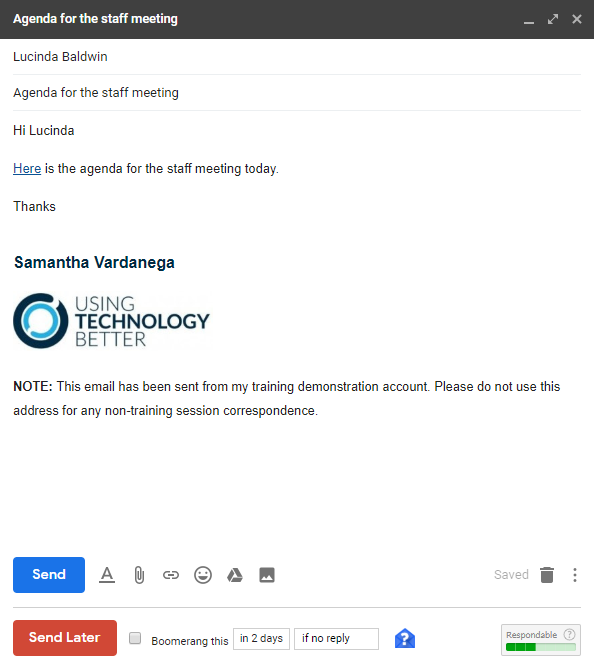 This can make scheduling meetings and working collaboratively challenging! 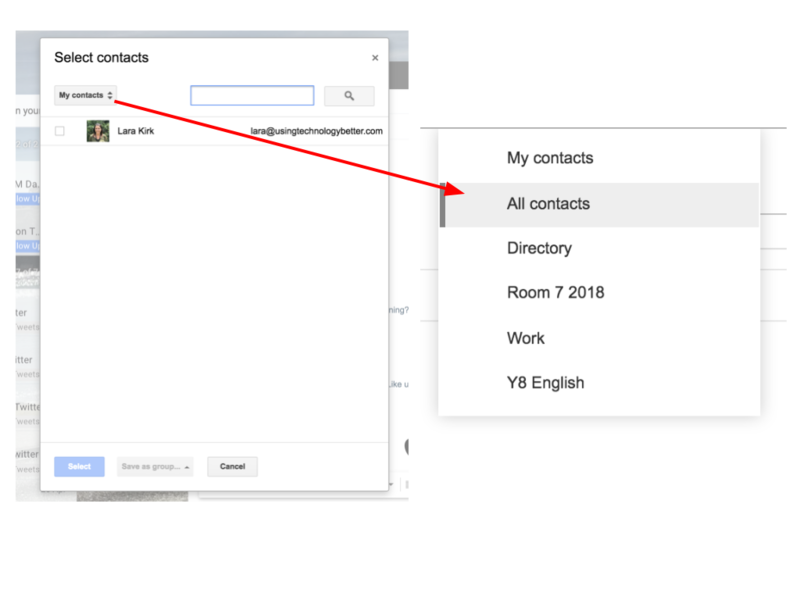 However, Google Calendar has three really useful features that can help make this much easier. In this post, I’ll show you how to use each of them. 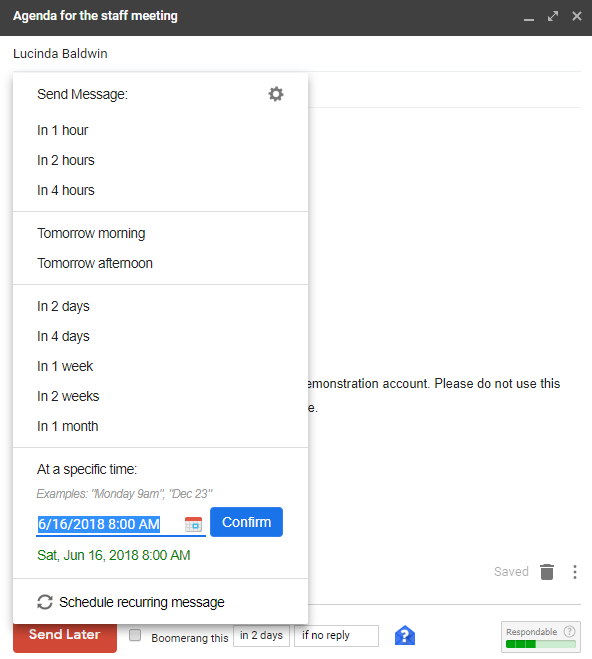 This setting displays an additional time zone on the main calendar screen, as shown below. 1. Select the Settings menu (cog) button > Settings. 2. Locate the Time zone section and tick the option to Display secondary time zone. 3. Select your desired secondary time zone from the drop down box. 4. 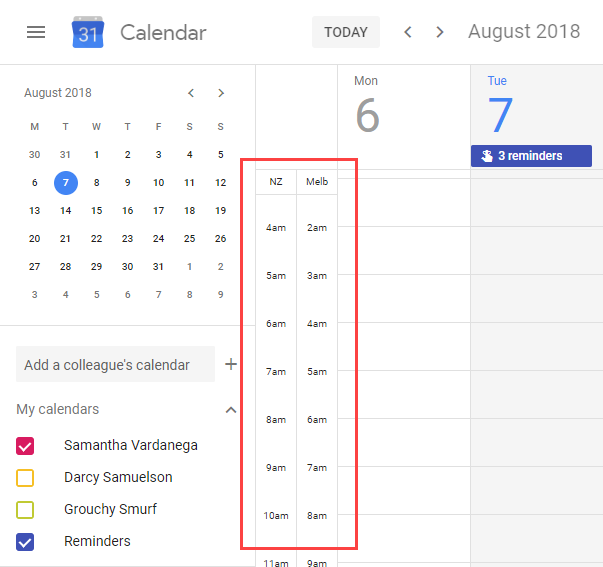 Add a Label for each time zone to make sure it easy to identify them in your calendar. 2. Locate the World clock section and tick the option to Show world clock. 3. 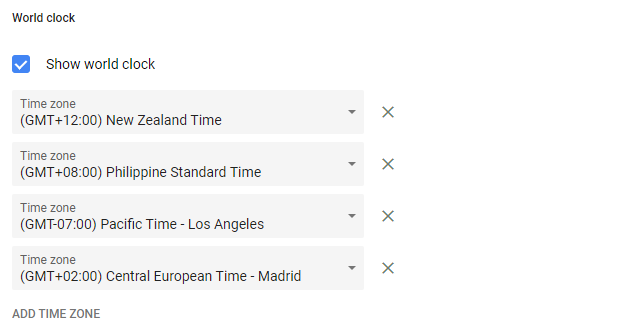 Choose the first time zone you want to add from the drop down list. 4. 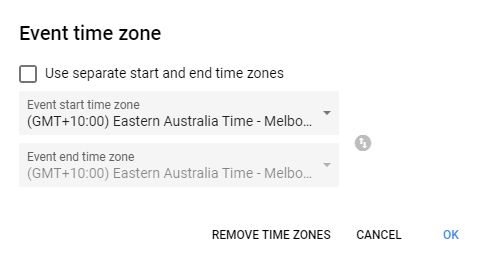 To add additional time zones, click the Add time zone button. 1. Create a new calendar event. 2. Click the Time zone button (located to the right of the date and time boxes). 3. Choose the relevant time zone from the drop down box. If needed, you can also use different start and end time zones. This is really useful when adding flights to your calendar that begin in one time zone and end in another. I hope that these three tips will make it easier for you to meet and collaborate with clients and colleagues in different time zones. 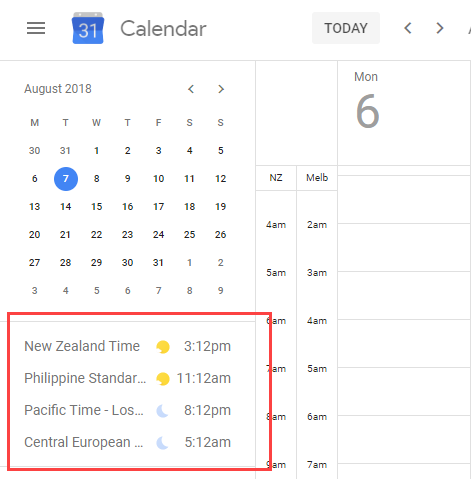 You can learn more about how to use Google Calendar in different time zones here. 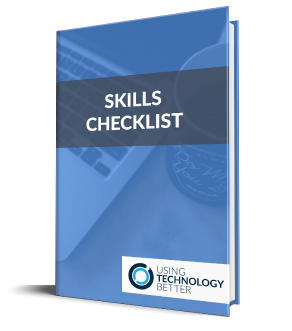 Want to learn even more G Suite tips and tricks? Enquire today about our deep dive workshops. 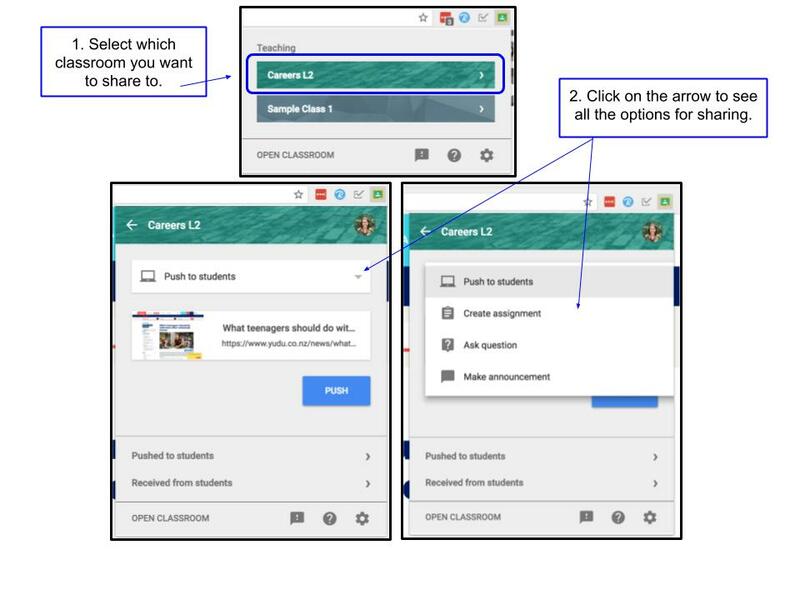 If you are using Google Classroom you’ll love the ‘Share to Classroom’ Chrome extension by Google. Google Classroom is a powerful platform for teachers to engage in learning with students. The ability to distribute and manage resources: assign, view and give feedback on tasks; encourage collaboration and student voice is loved by teachers the world over. 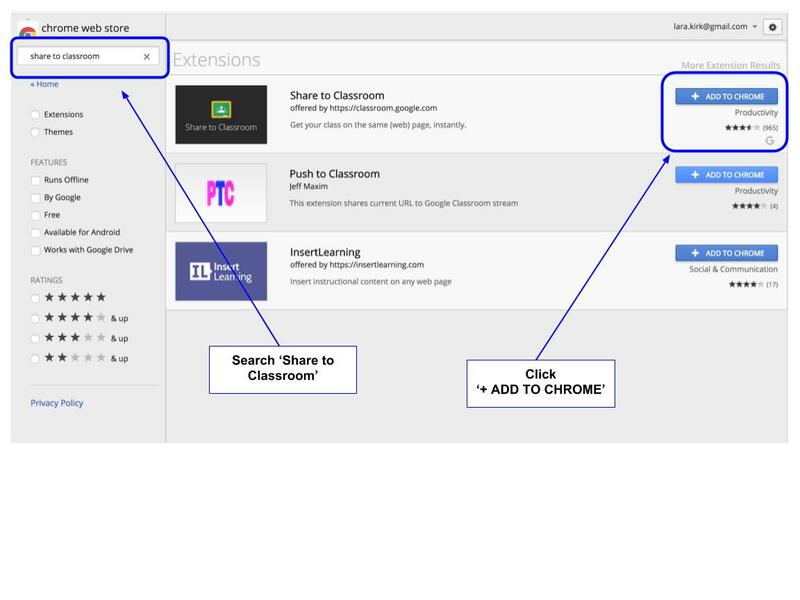 If you haven’t added this extension yet just head to the Chrome Web Store and search for ‘Share to Classroom’ (or click that link!). Click on ‘+ ADD TO CHROME’. Once added extensions can be accessed from beside the Omnibox in Chrome. 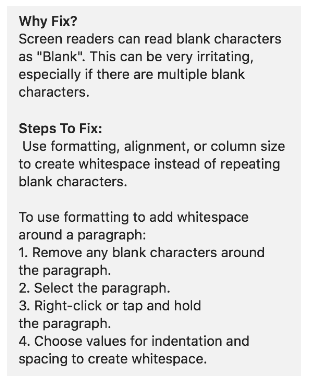 If you find something online that you want to share with your students in Classroom you can do this really easily from the page that you want to use. Selecting this will instantly open the webpage on any active students (and co-teachers) browser windows, as long as they are signed into Chrome. Great for being flexible and adaptable in the classroom. An easy way to direct all your students to the same place. 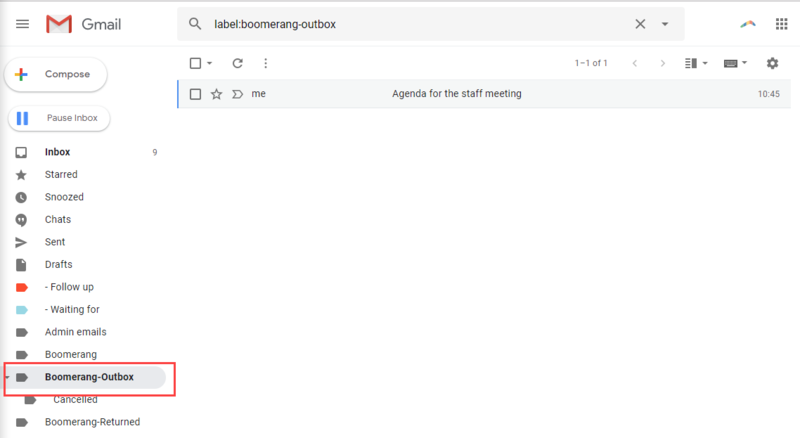 You can also push a Google Doc (or other tool) if you want to get everyone collaborating in one place. 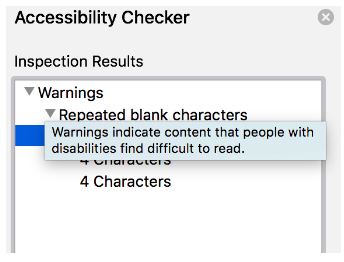 Students can push pages to you as well. If they do this you will receive a message and can choose to open the page. You can mute this in the notification settings. The pages that have been shared (both by you and your students) are stored for 18 hours in these menus. You get the same options here, for each type of post, as you do when you are in Google Classroom. If you are sharing a Google Doc as an assignment you will also be able to select if you want the students to view, edit or have their own copy of a doc. 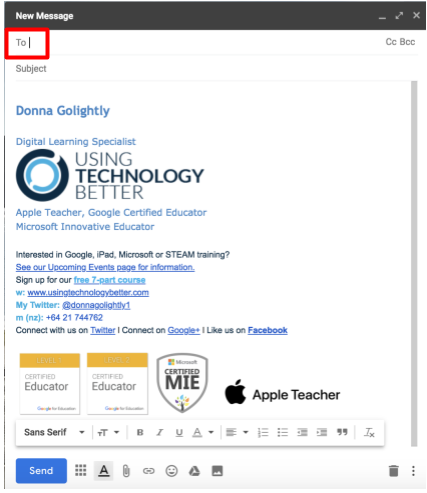 Check out our other blog posts with tips and tricks for GSuite tools or find out if one of our Google Certified Educator Boot Camps is being held near you! 1. Conditional formatting, which allows you to colour cells based on a condition like the size of a number, or even apply a colour scale to bring more clarity to your Google Sheet. 2. Data Validation, which allows you to create a drop-down list of items or regulate what data can be entered in a cell. 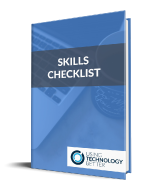 Watch this video to learn how to use these tools to further develop your skills in gaining insights into your data and to build a Google Sheet that can be used easily by others.